Now available on Wii U™, PC, Xbox One™, PS4™, New Nintendo 3DS™ and Nintendo Switch™! Buy the game on digital or retail, or related stuff such as shirts, posters and the soundtrack! Key art, screenshots, trailers, and more! Everything about the world of Runbow, here. of the background, and it changes a lot. Platforms and obstacles that disappear into the background disappear completely. 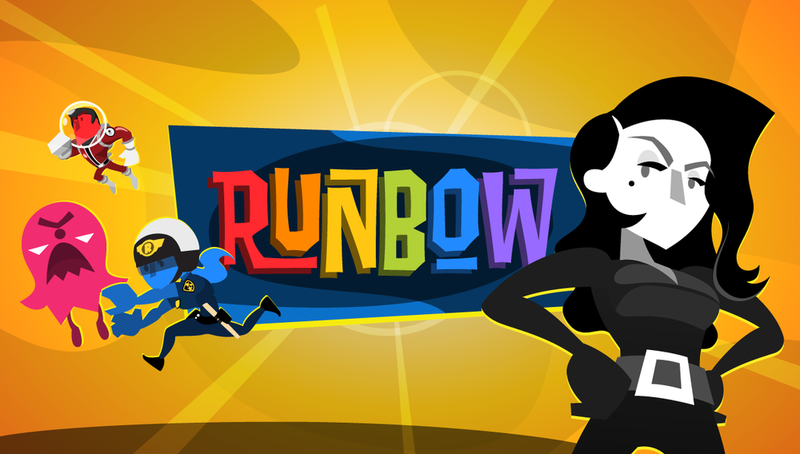 Can't get everyone over for a Runbow game night? Take the race online with Run, Arena, and King of the Hill. Join an Open Party and see what challengers are waiting, or host a Private Party for you and all your friends. Join Hue and Val as they race through over 140 challenges in Adventure to stop the evil Satura once and for all! ColourMaster! Drop bombs, lightning bolts, paint blobs and more to stop the Run Team from getting to the trophy! NOTE: ColourMaster Mode is only available with the Nintendo Wii U™ console. locally in any mode, or master Adventure and Bowhemoth all by yourself! The biggest Indie Guest Roster that you've ever seen, with guests from some of the greatest games on the Wii U™ eShop! Join Shovel Knight, Rusty, CommanderVideo and more! Take on challenges in Adventure to unlock characters, costumes, concept art and more, then go view them in Runbow's massive gallery!